(Technorati claim: 4WKUTNWFFKH6) A fresh poll of CIOs by Gartner has indicated that 43% of CIOs and CTOs view the role of technology primarily as a way to drive business growth. This is a growing trend that should drive beneficial results. Too often, the business demands ways to reduce operating expenses without any consideration for the opportunity cost for focusing on revenue growth. Unless a business has a higher cost structure than sales, a 10% increase in revenue is going to have greater value than a 10% reduction in costs. 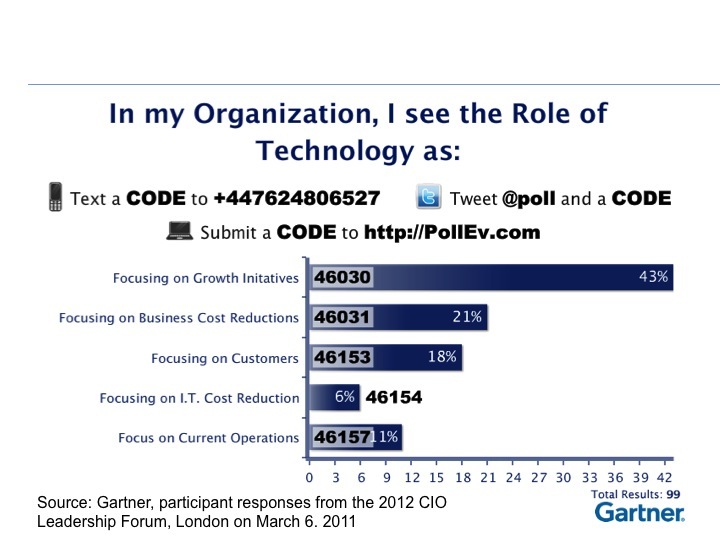 21% of CIOs and CTOs view the role of technology to cut business costs. An additional 6% focus on reducing IT operating costs. 18% focus on enhancing the customer experience. 11% focus on supporting existing operations. When preparing your brand message and deciding how best to communicate that in the CIO or CTO resume, keep these stats in mind. Primarily focus your achievements on revenue growth. Follow that up with good stories about how you led initiatives to drive down organizational costs, streamline operations, and strengthen customer relationships. To arm yourself with more tools in your technical job search arsenal, we offer a free Technical Jobs report & Online Identity Assessment to our followers. We also offer a 10% discount to our followers. Take advantage of our offer just by signing up to follow this blog or go to our website ITtechExec (be sure to indicate in the “How did you hear about us?” box that you found us through our blog). In addition, you’ll want to join us on Wednesday’s at 3pm Eastern for the Tech Career Forum Twitter Chat by using the hashtag #TCFchat. See you there!